Hope you’ve had a good week! Last week I went to Brighton for a couple of days with a friend. This trip had been planned for a long time. We wanted to go away somewhere to celebrate the fact we had finished school! We decided on Brighton. 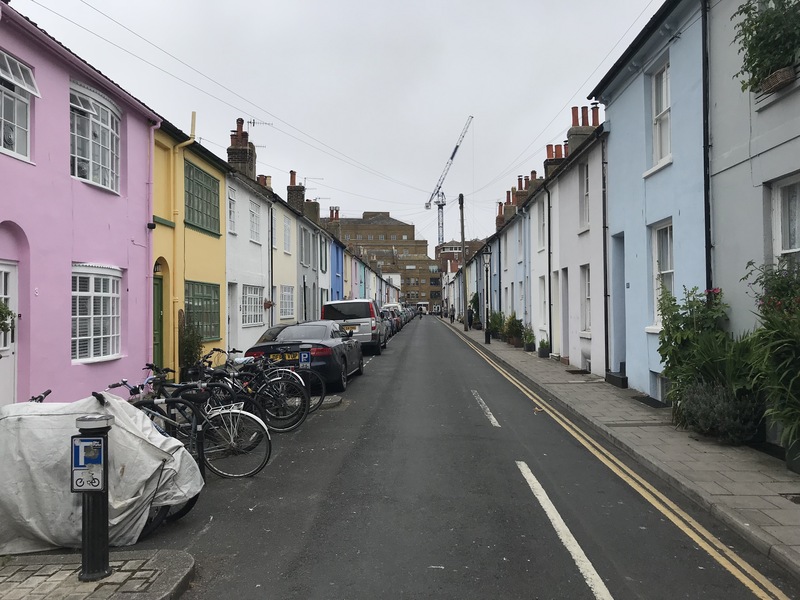 I’ve been to Brighton a few times and I’ve done a post showing pictures from before you can read that here. We travelled to Brighton by train, this was a pretty long train journey. It took two and a half hours to get there. When we arrived we took the long walk to our hotel. It was only about 25 minutes but pulling our heavy cases it felt like it took forever! We stayed in a hotel called The Blanch House Hotel which is in Kemptown and on a road just down from the seafront. The hotel was really lovely I don’t have any photos of the room because as soon as we arrived it was messed up pretty much straight away! Once we had dumped our stuff in the hotel we went for a walk along the beach. 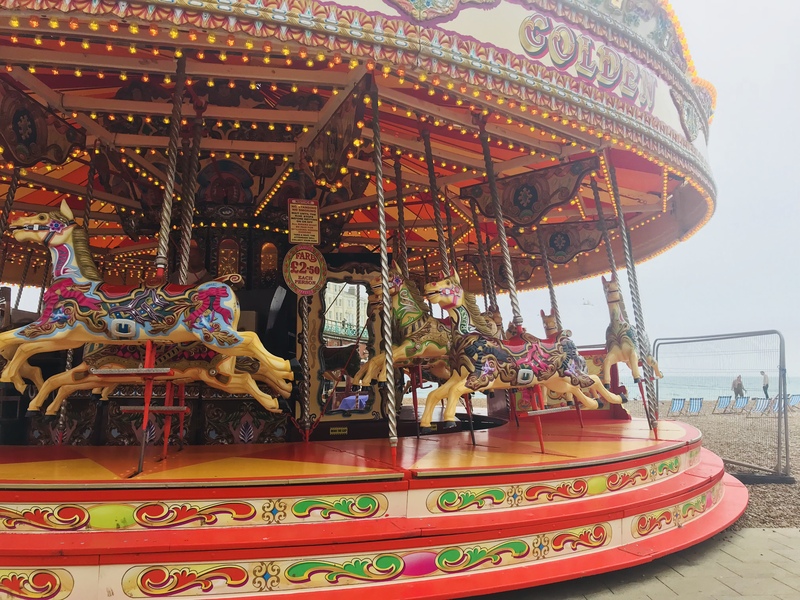 We walked down the pier and to the fun fair and the little shops in the arches. Here’s a photo of the carousel. I love the look of these old-fashioned fairground rides with all the lights. 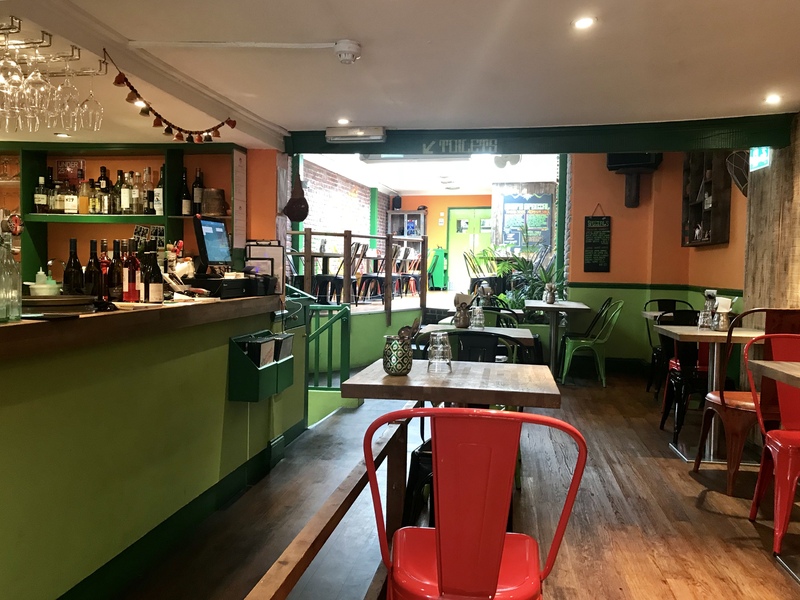 For our tea on the first night we went to Peruzzi, which is an all plant based (so everything was vegan) pizza restaurant in Kemptown. It was quite near to our hotel so we ate there then went back to watch Love Island. The photo above is inside the restaurant which was really cute! 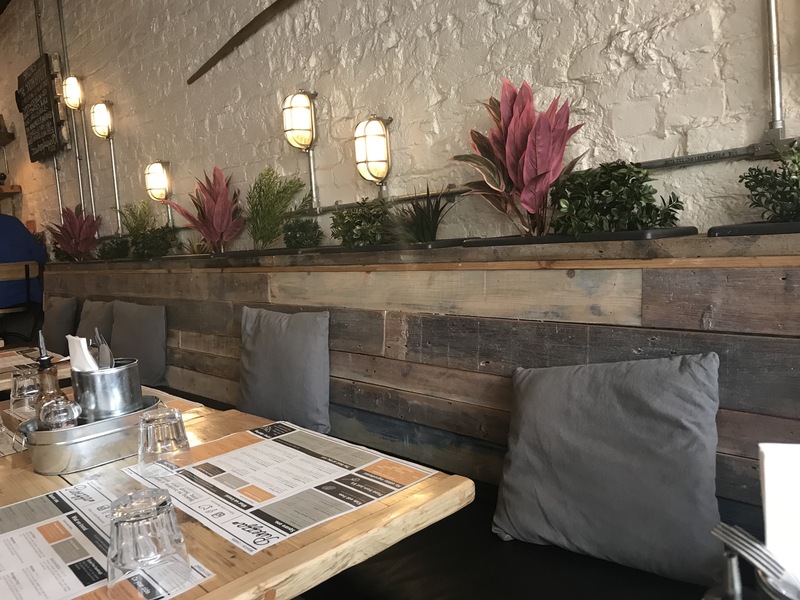 I was opposite pizza paddle and all the while we were waiting for our food I was wondering why there were oars on the wall – ha ha! 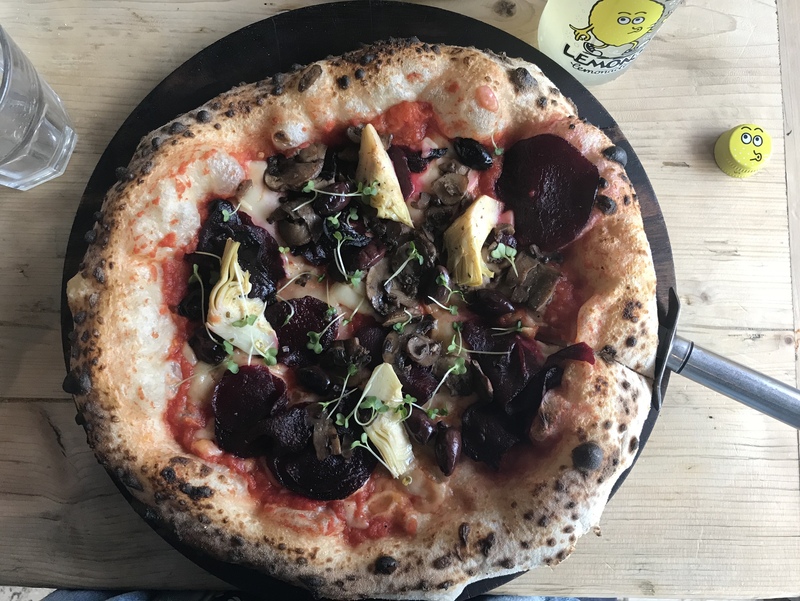 This was my pizza I can’t remember what it was called but it had beetroot, mushrooms and artichoke on. It was really good! For dessert, we shared this dessert pizza which was basically a pizza base with chocolate sauce Oreos and cream on! It was delicious!! It may sound a little gross a sweet pizza but it kinda tasted of chocolate waffles! – and it was all vegan! 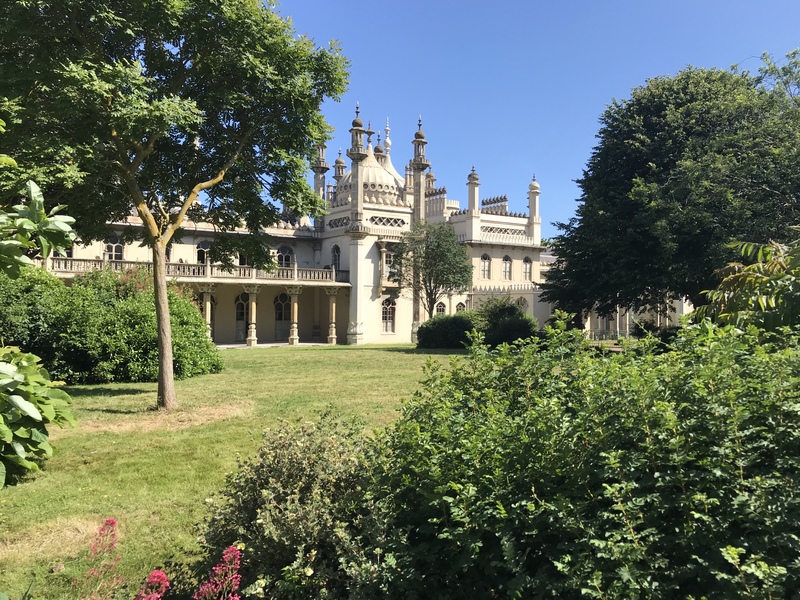 We went to the Royal Pavilion gardens. We didn’t actually go inside the building but walked around the gardens. The weather was so lovely. I really like the photo above, the building looks so beautiful. 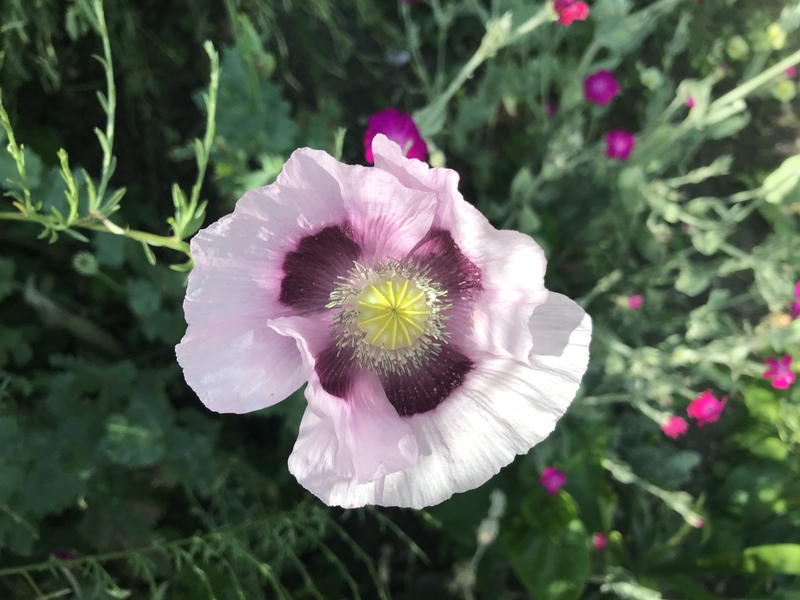 This is a pink poppy I saw in the pavilion gardens. I love taking pictures of flowers. I took lots more flower photos in the gardens but I decided to just pick one for this post. But I don’t want to fill it with flowers, as lovely as they are!! The next day we went shopping in the Laines and the shopping centre in town. I bought myself a couple of bits and bobs (I’m gonna talk about these in another post). I like this street with all the different coloured buildings so I took a photo! 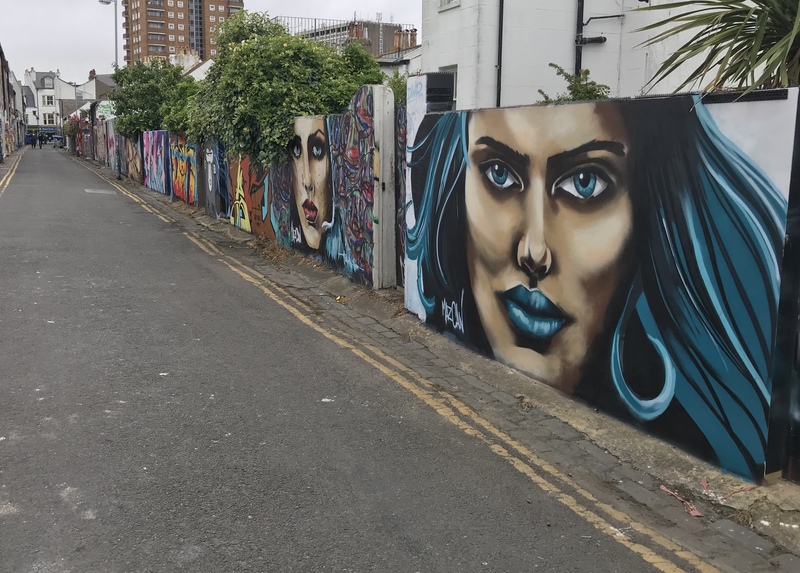 There is so much cool street art in Brighton, this road was just covered in it! Here is another face I think they were pretty cool! – a sidenote my phone let me face swap with faces in snapchat that was funny!! 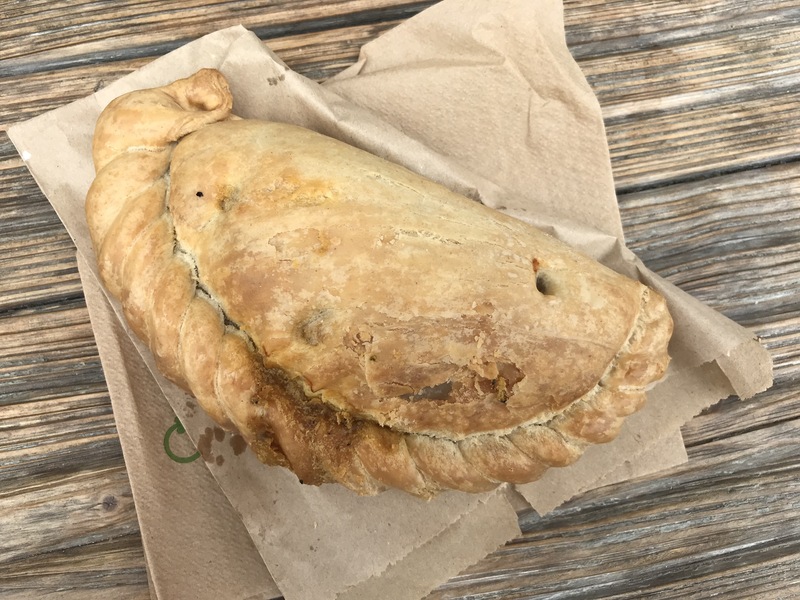 For lunch that day I had a pasty from the Cornish pasty shop in the Laines. And of course, I couldn’t go to Brighton without getting some Ice cream! 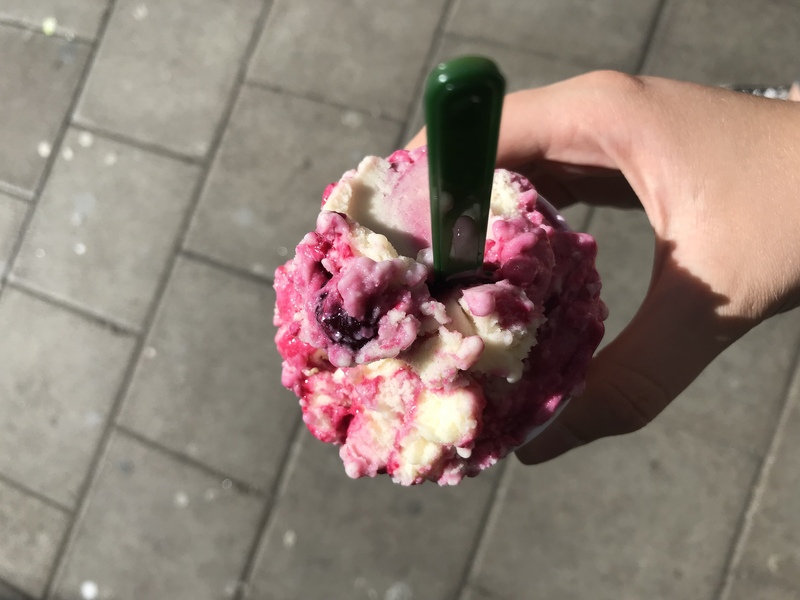 This is sour cherry gelato from Boho Gelato – it was delicious! For dinner, we went to the Curry Leaf Cafe. Here’s another picture of my food, again it was delicious! 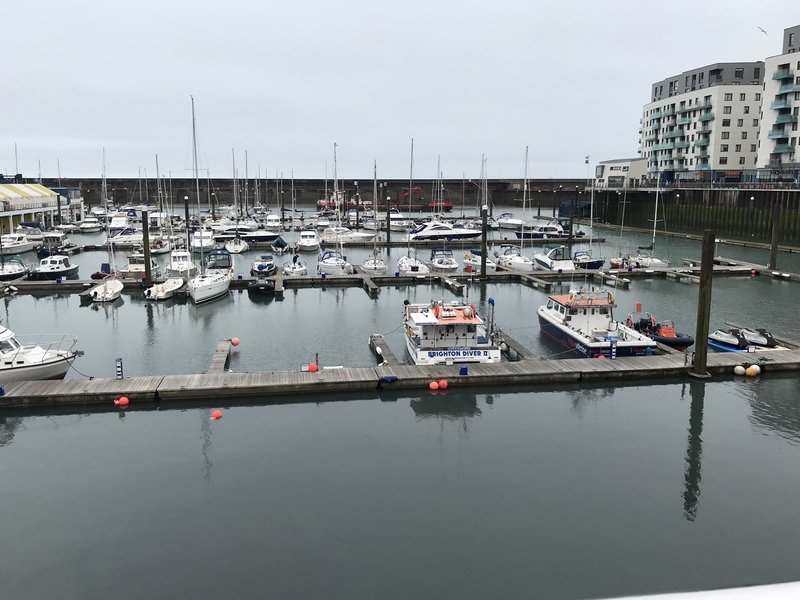 On the final morning, we walked down to the marina. The marina was quiet apart from glow balls which was really busy. We had to do the Jurrasic course which I’d done before rather than the newer Tropicana course. Everything glowed we even bought some of the glow stick glasses so we glowed too! 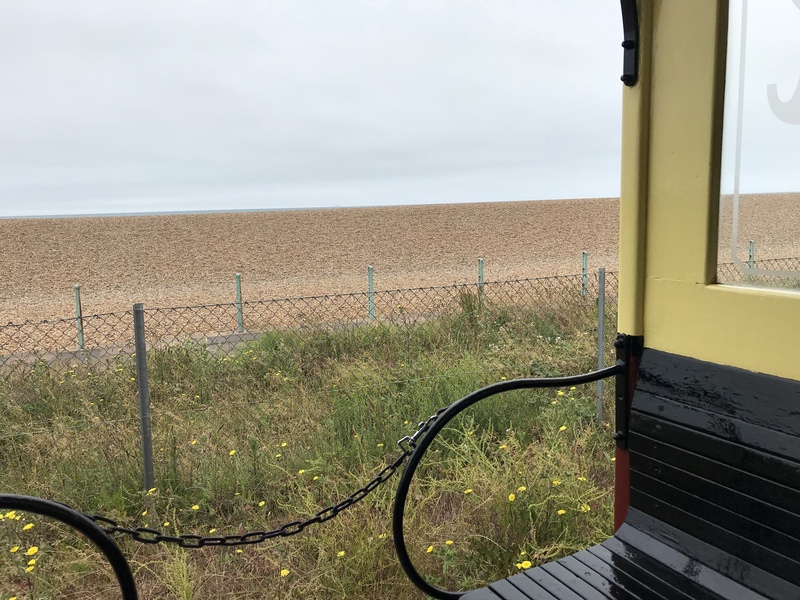 Then we got the little electric volks train back to our hotel where we got our luggage and walked back to the actual train station to head back home. Thank-you so much for reading, hope you enjoyed! I’m currently away on holiday in Croatia, follow me on Instagram to see some highlights of my trip! Have you ever visited Brighton? What’s your favourite seaside town? I’d love to know in the comments below! Exams are over, looking to the future. Brighton sounds like such a lovely city! Loving those colorful houses! 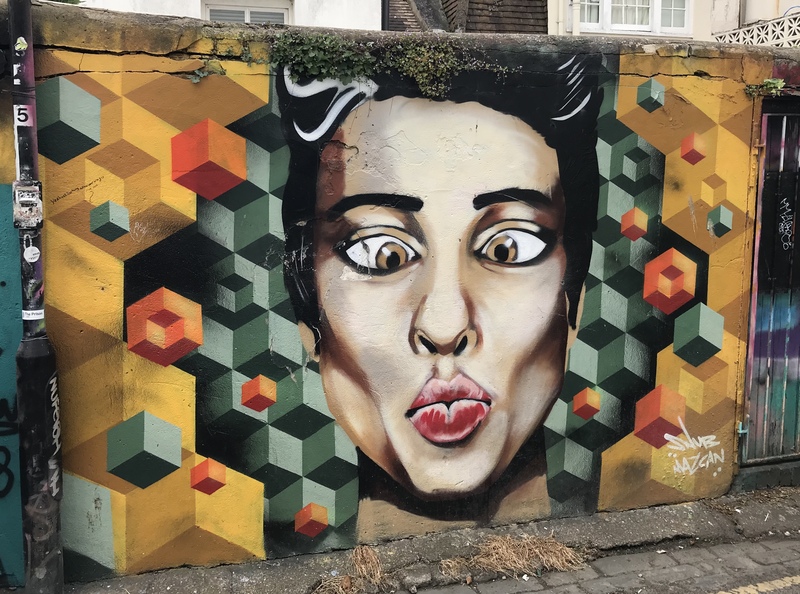 And that street art! And, OMG, the food! It looks so so good! Thank you! It is a lovely city I really enjoy visiting Brighton and the food IS the best!! I go to Brighton/Eastbourne once a year with my son to visit a friend! It’s such a beautiful place! I’m glad you’ve had a wonderful time. Was the vegan meal enough to possibly sway you to the dark side? Regardless of whether it converts you or not, I love seeing people trying out vegan food! People don’t realise how yummy it is! 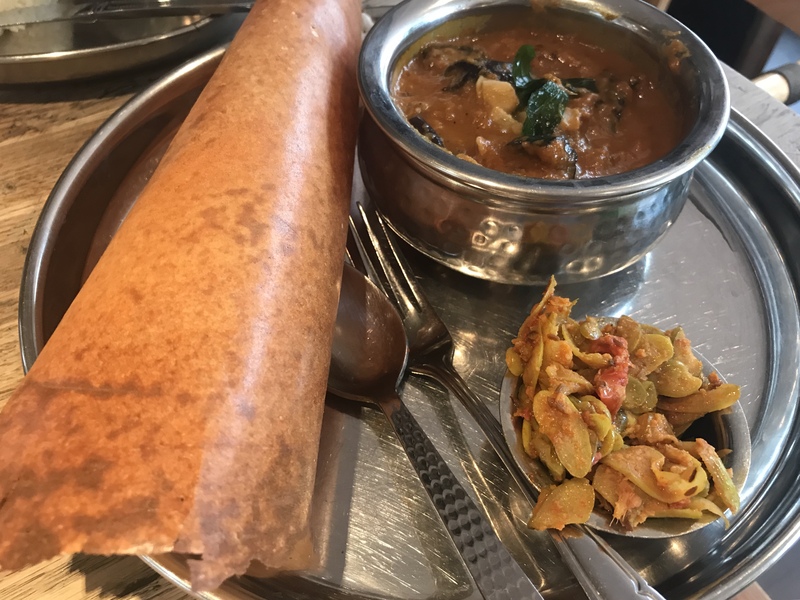 The food is delicious in Brighton I am already vegan so all the food in this post is vegan. Vegan cookies are the best but the vegan raspberries brownies I make are actually amazing if I do say so myself. I always have such a nice time when I visit Brighton, the food is amazing and so many vegan options! I love Brighton, it’s definitely worth a visit. Love this! Brighton looks lovely. 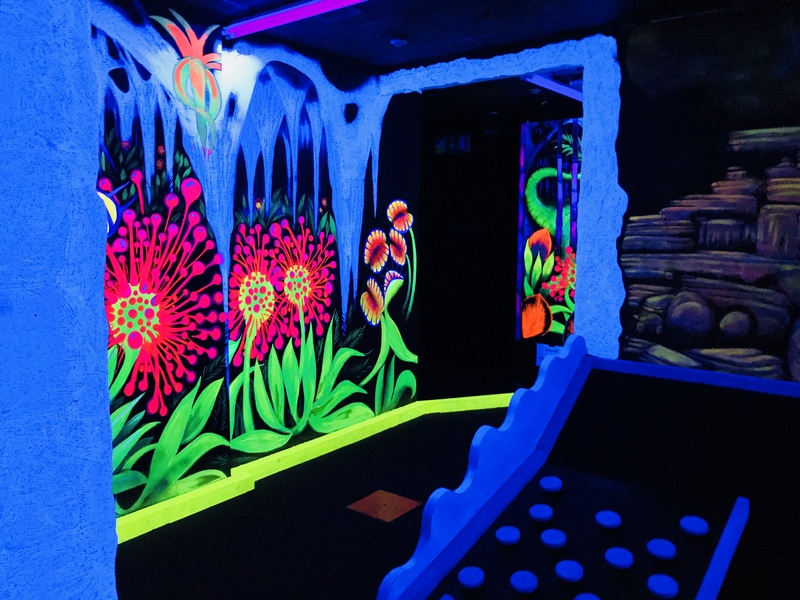 It’s always somewhere I have fancied visiting, will add it to my bucket list! The pizza place is definitely worth it! I hope you have an amazing time! 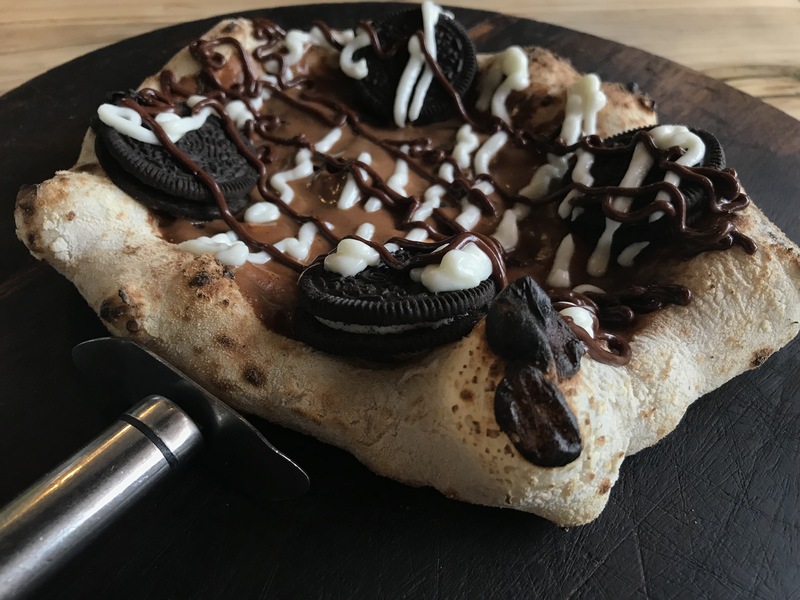 I love Brighton, you got so many amazing photos and that dessert pizza looks so good, I definitely need to get my hands on one!